Tip #1: One step at a time. Before you begin the remodeling process, you will want to create a game plan. The game plan will be more of a general outline rather than an exact timeline. Unexpected circumstances will arise and some dates will be pushed back. Our best advice for you is to take it one step at a time. Focus on one room at a time. You do not want to overwhelm yourself. Experts recommend starting off with your living room. It is one of the easiest rooms to remodel and get ready for resale. It will give you a good look at what to expect during the remodeling process. Tip #2: Light up the day, Dim the night. Buyers LOVE natural light. You want to make sure that your rooms include enough natural light during the day. Open up curtains and blinds during house tours to show off the natural light. During the nighttime, buyers love having the options to dim the lights. If it is within your budget, buy dimmers for your living room and master bedroom. Even though we are flooring experts, we want to assure you that all design experts recommend buying high-quality flooring. A common mistake made by homeowners is buying cheap, inexpensive flooring for a resell. However, buyers can recognize when the flooring is cheap and low-quality. You will not be fooling any buyers if you purchase low-quality flooring. Take time to save for a flooring that can be cherished by the new homeowner. Tip #4: Kitchens + Bathrooms. Kitchens are the number one room that increases your home’s value. 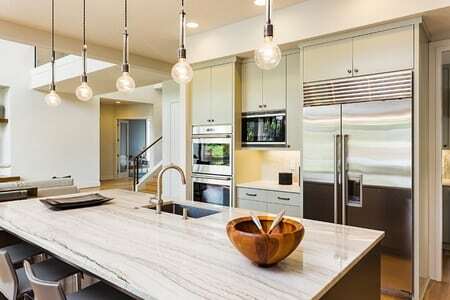 Experts say that “the flow” of your kitchen is one of the most detrimental parts of the space. How your appliances are placed in retrospect of one another can be an important factor in the buyer’s decision process. Experts recommend following a “triangle pattern” when setting up your new kitchen. The sink, dishwasher, and cooking appliances should make up the three points of the triangle. Don’t forget to pay special attention to the flooring in your kitchen. Wood-look tile is the perfect way to add classic style to your kitchen since it is safe around water and spills! Tip #5: Take a look outside. Your home’s curb appeal is extremely important for resale. A lot of homeowners will skip out on curb appeal, but this can be a giant mistake. Your home’s curb appeal affects the neighborhood surrounding it. Home buyers do not want to purchase the home with a less-than-appealing exterior. Try to keep your lawn and garden tidy for house showings. For high-quality tile and stone, be sure to stop by our showroom. Our staff will work hard to help you choose the appropriate flooring to increase your home’s value.